This brand new book uses beautiful photographs to illustrate the wide range of body designs used on the classic Seagrave chassis. See all kinds of classic Seagraves, ranging from wide-open doorless cab models with sporty one-piece fold-down windshields, to radically streamlined completely enclosed Safety Sedan bodies. This design was utilized for virtually every type of fire apparatus - pumping engines, aerial ladder trucks of both the straight frame and articulated tractor trailer type, city service ladder trucks, quadruple and quintuple combinations, and special units like rescue squad trucks and hose trucks. The classic Seagrave is timeless. Its distinctive waterfall grille is widely regarded as a high mark in the 20th Century American fire engine builder's unique art. If you're a fire apparatus enthusiast, you'll want to add this book to your collection. 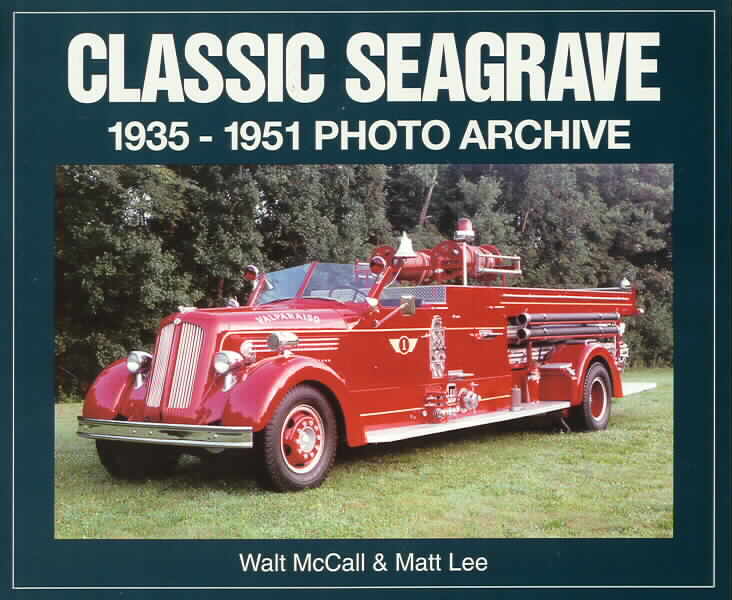 The perfect companion to McCall's Seagrave 70th Anniversary Series Photo Archive.